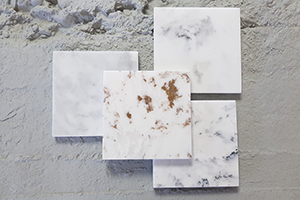 Versital offer a range of natural looking marble and granite finishes, as well as an exclusive range of fabulous sparkle surfaces called ‘Reflect’ and our newest addition metallic marble. Please click on the colour groups below to browse the full range. These images are for illustration only. For a true representation please order a FREE colour sample by clicking ORDER SAMPLE next to each colour description. 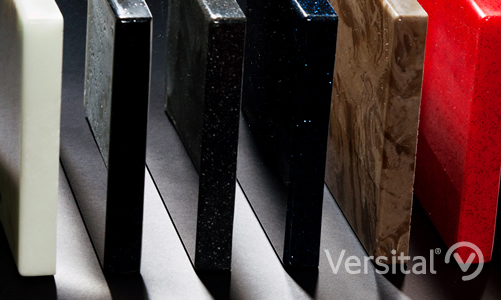 Wide choice of true to life marble and granite finish options, as well as high gloss black sparkle’s. Beautiful true to life marble, granite and high gloss sparkle finishes in various white hues. Beautiful true to life marble, granite and high gloss sparkle finishes in a range of cream and brown tones. Extensive range of marble, granite and sparkle finishes in a variety of red and pink colour options. Beautiful marble and sparkle finishes in warm yellows and oranges. Vibrant marble and granite finishes in a range of green hues. Choose from subtle through to striking. Marble, granite and sparkle finishes in a range of blue hues. Choose from subtle to striking. Royal violet marble and sparkle finishes in a range of hues. Choose from subtle to striking. Versital also offer a range of Solid High Gloss RAL colour options. Choose from the most popular RAL colours, or as a commercial client you can choose from the full range. If you need advice choosing your colour combinations, or how to order samples please get in touch.